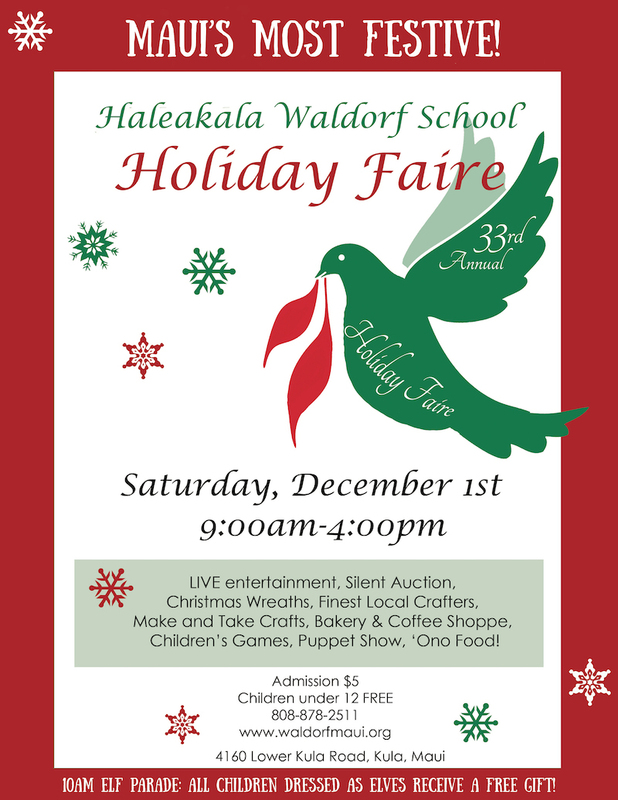 As the sun warms the cool upcountry morning air, dew still sparkling on fresh evergreens, Haleakala Waldorf School’s 33rd Anniversary Holiday Faire will unfold Saturday, December 1st, 9 am – 4 pm. This is the place on Maui where you are sure to experience the magical sights, scents, and festive cheer of the holiday season. Located at the school’s historic campus in Kula, Haleakala Waldorf School has offered this beautiful holiday celebration for over 30 years. It is not to be missed by families island-wide, and has grown into one of the best events on Maui! Shop amongst the very best gifts from local crafters and artists, homemade baked goods, and farmer’s market. Enjoy live entertainment while you relax with an ‘ono lunch. Take a photo with Father Christmas or delight your children with a beautiful Waldorf puppet show. Dip a beeswax candle or create a magical gnome garden at one of their many interactive “Make and Take” craft booths. Place a few bids at the Silent Auction where gallery art, vacation packages, activities, and dining certificates are just a few of the fantastic finds available. The day wouldn’t be complete without taking home an exquisite Christmas wreath. They are handmade with fresh natural materials such as juniper, Christmas berry, lavender, evergreens, and hydrangea which are collected and prepared just days before the Faire. Also be sure to come early with the little ones for the 10am Elf Parade! Every child dressed as Santa’s helper will receive a FREE gift! Haleakala Waldorf School is located in upcountry Kula, across from the Kula Post Office. Admission is $5, and children under 12 are free. For more information, please call 878-2511 or visit www.waldorfmaui.org.